Precise specification of cell fate and synaptic connectivity are at the heart of the remarkable formation and functioning of complex neuromuscular networks. Defects in some of these processes early in development and adulthood have been implicated in many health disorders. Studying animal models with simpler and well-defined motor circuits with functional correlates to those of mammals can make significant advances in the elucidation of mechanisms of differentiation and plasticity of electrically active cell phenotypes. 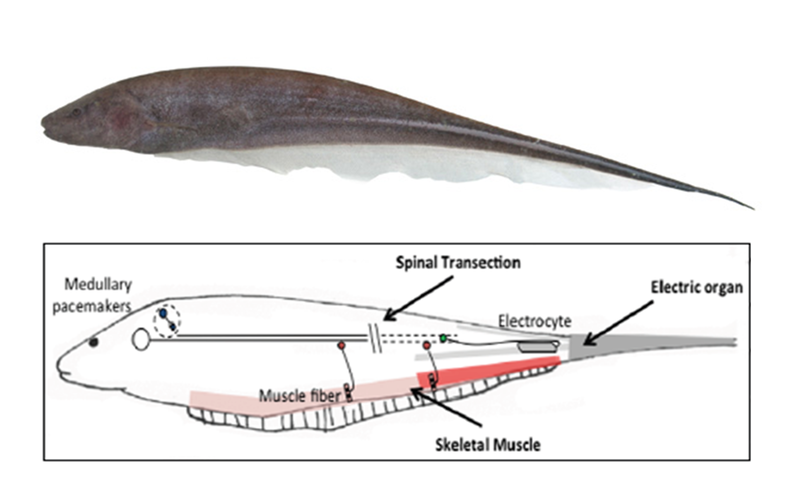 We use the electromotor system of South American fresh-water electric fish species as a model system to study the regeneration of distinct components in the neuromuscular and electromotor neuronal circuits in the adult organism. 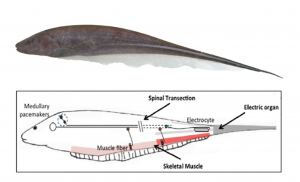 The electromotor system controls the electric organ discharge (EOD) used by electric fish in many social interactions like predation, communication with other fish, and sensing the environment around them. This circuit consists of a medullary pacemaker nucleus (PMN) containing two or three neuronal types, spinal electromotor neurons (EMNs), and one muscle-derived electric organ (EO) outside the central nervous system – an organization with similar correlates in mammals. 5) The neural-dependent modification of skeletal muscle to switch to become the electric organ, a non-contractile tissue that retains many muscle properties but it is specialized to generate electricity.